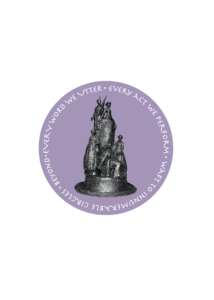 “Every Word We Utter,” depicts Susan B. Anthony and Elizabeth Cady Stanton as a drop of water that forms the ripples of perpetual change. Inspired by a letter from Stanton to Lucretia Mott in which she wrote about the power of every gesture in the women’s movement: “Every word we utter, every act we perform, waft unto innumerable circles beyond”, the composition centrally places Anthony and Stanton writing the Nineteenth Amendment. This nucleus holds the beginning of the women’s movement. To the side of the authors stands the elder Sojourner Truth, a beacon for the movement. The young Harriet Stanton Blatch represents the future. From this nucleus a coalescent cascade rises, elevating the future soldiers of the movement. It was the continued efforts of these “daughters” represented by that achieved the ratification of the 19th Amendment, represented by Ida B. Wells and Alice Paul. The American flag occupies the pinnacle of the monument with the ratification flag cascading down to the innumerable circles that ripple outwards. 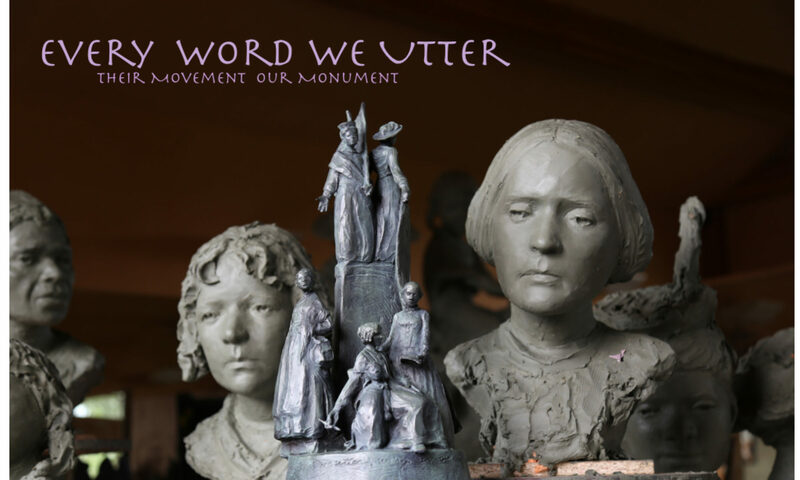 I know that together we can create and install the monument Every Word We Utter in a prominent location before the 100th Anniversary of the 19 Amendment (August 2020). 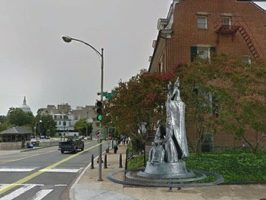 I personally am hoping for a site in Washington D.C., and have reached out the National Women’s Party regarding a potential site and the process for making a donation in all our names. As I am moving forward with the enlargement and I am asking for your help to cover the costs. I believe that Every Word We Utter will inspire young women to take action, make their voices heard and continue the movement as Sojourner Truth once said “to set the world right-side up again”. 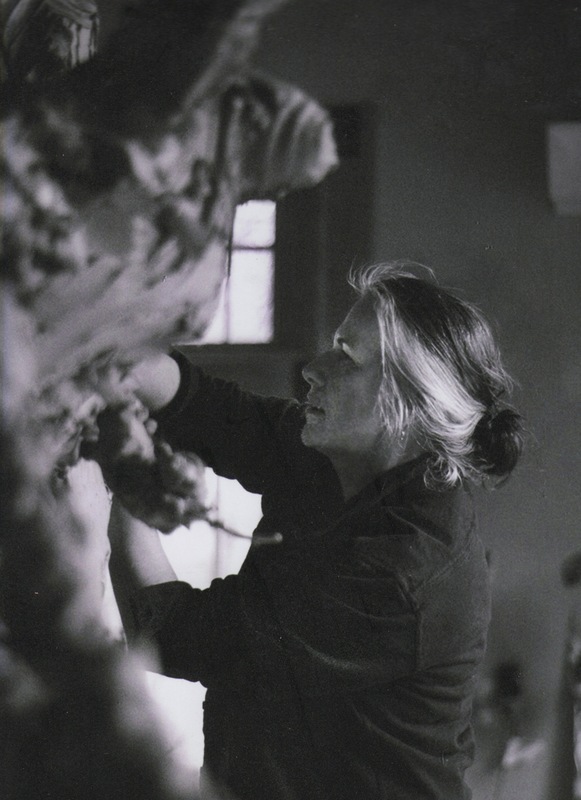 The ripples have come under my feet, and my gestures in clay are my contributions to the continued work that we as women need to do. The work is not done. I believe the words of Anthony and Stanton still inspire, for these words were meant for action. indeed, these words became action. Actions became the movement. Let the ripples come under your feet and let them hear Every Word We Utter. The monument will be approximatley 17 to 20 foot high. Center circle 7 foot in Diameter. Could be an edition where multiple copies could be cast for different locations. We are in the process of completing our 501(c)(3) paperwork and process. A 501(c)(3) status is pending. DeDecker’s most recent commission, “On the Banks of Sugar Creek” reveals the connection between artist, community, and installation site. 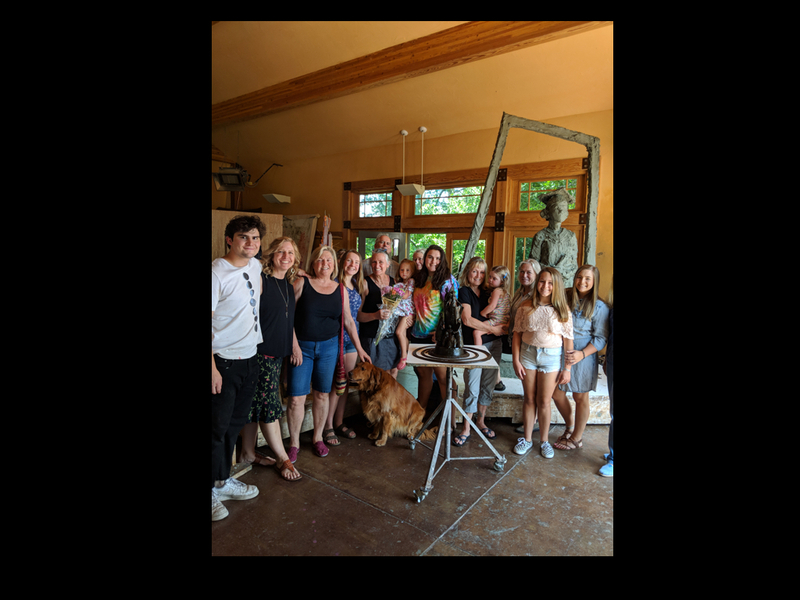 To commemorate 125 years of the Thompson Child and Family Focus organization, DeDecker sculpted a composition that warmly reminds us to take time to sit down with children – just listening to a child can be life-changing. DeDecker read notes from the founder of the organization, Edwin Osborne, to search for his passion and intent. In his journal, Osborne wrote about the many orphaned children after the Civil War, and the urgency to not only give these children a home but to preserve their childhood. He wrote that the smell of strawberries took him back to his own childhood memories. Jane also read the recollection of many of the orphans who wrote about time spent at the creek playing in the muddy water. In her piece, DeDecker depicted Osborne sitting next to children on the banks of the creek, at the original site of the orphanage. The shoes are lined up near the creek, in the same way you might find a neat row of shoes inside the front door at home. Osborne leans back, and time stands still for a moment as he sits with the children. Listening. One boy holds a leaf filled with strawberries. Another boy has his hands folded in a way that mimics his mentor. A young girl wiggles the mud between her toes. DeDecker’s final composition not only expresses the history of the foundation, but preserves the heart and soul of its dedication to children. 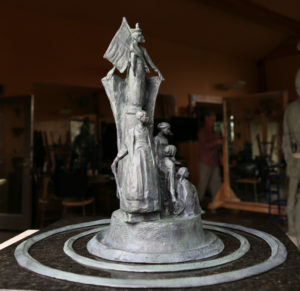 The first bronze ripple will hold the names of the women on the first tier of the monument along with their contemporaries, names such as Lucretia Mott, Lucy Stone, Frances Willard. These are the women who envisioned the women’s right to vote. The next ripple includes the names of the second wave of the movement, those women who experienced the ratification of the nineteenth Amendment and voted for the first time, Alva Belmont, Inez Mullholand and Lucy Burns. 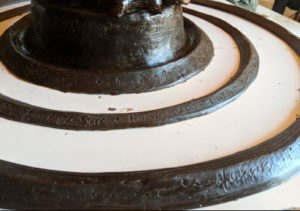 The outer bronze ripple, which comes to the edge of the fence, could represent the names of women who have made significant contributions to the ideals of the sentiments, not just the right to vote, but continued efforts for equality for all women, women such as Eleanor Roosevelt, Maya Angelou, Ruth Bader Ginsburg, Sonia Sotomayor, and maybe some of the younger generation. Visit Janededecker.com/the-artist for more information on Jane.